Yaay, it’s time for budget Monday! And sometimes our skin just need some extra attention and we also need a little relax moment. And what is perfect for this? A face mask of course! And we all know the classic face mask that you can apply yourself. But more and more you see sheet masks. This is a mask drenched in a liquid. This masks are easy to just lay on your face. And the most of the time these masks have a jelly or milky structure. 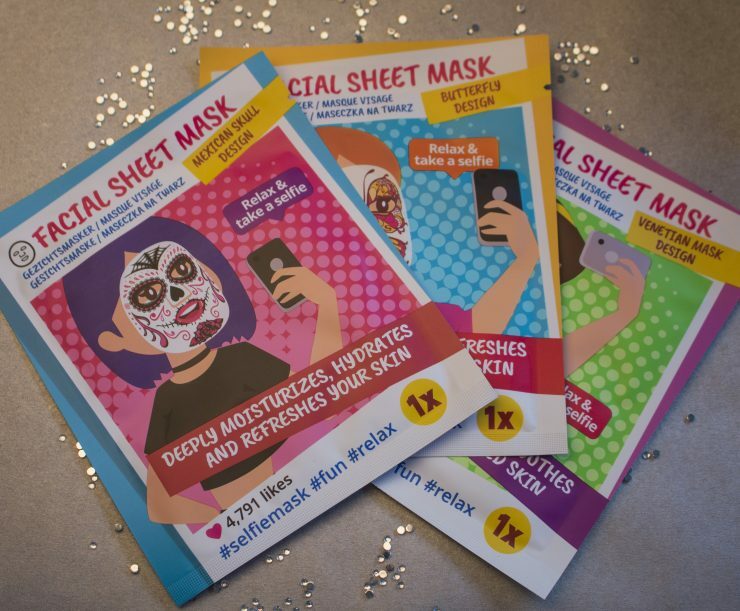 But there is even more… because there are also sheet masks with a cool print on it! In the action I found 3 funny looking sheet masks. A Venetian mask design, Mexican skull and one with a butterfly on it! They already look cool but do they do something for your skin? How to use these sheet masks? Start with cleaning your face, that you can apply the mask onto your dry skin. Leave the mask on your skin for 15 till 20 minutes. Then you can remove the mask and massage the remaining serum into your skin and cleanse it with warm water. This sheet mask is with blueberry and must make your skin feel soft again. From all the three the masks is this one for sure my favorite! It doesn’t only looks nice but it also smells so good! It gives my skin that extra boost that it sometimes need! It makes my skin so soft and also hydrates it! This is for sure a mask that I would buy again! Especially because this is the perfect mask to give your skin a refreshing boost! This mask is with pomegranate and hydrates your skin. This mask also looks so cute and smells good! When you bring this onto your skin it feels so refreshing! It gives your skin that refreshing boost that it sometimes need, and your skin will look good and hydrated! This one is with wild rose and must gently cleans your skin. Or this really cleans my skin on a gently way, I don’t know… But it’s for sure a good mask to try out! And it does almost the same as the two mask above. It makes your skin feel good and soft. All the masks just almost work the same. So these make your skin soft and also hydrates it. But the Venetian mask is for sure my favorite! Because this one give that extra boost to my skin and smells so good! So these sheet masks not only look cool, but they also work good! I only can recommend these sheet masks! They are also handy to take with you. I found these facial selfie sheet mask in the action for €0,99 apiece. Wat een leuke maskertjes! Fijn dat ze allemaal hydraterend werken en lekker ruiken. Ja he, deze zien er echt leuk uit! Deze zijn echt leuk!! Leuk artikel heb je er van gemaakt.